MSA’s Latchways Constant Force® post for Kalzip standing seam (65/400) roofing has successfully completed all Deutsches Institut für Bautechnik (DIBt) testing and approvals. Having worked closely with Kalzip, MSA can now offer DIBt certification for work-at-height safety across Germany, giving access to the engineered fall protection systems and PPE that have long since set the standard worldwide. Further profiles are currently undergoing testing. The EU Commission has ruled that type A, C and D anchor devices in EN 795:2012 are no longer considered to be Personal Protection Equipment, but are instead Construction Products. Pending a new standard, DIBt has introduced a national requirement for testing and certification (abZ). Following satisfactory DIBt testing, abZ-certified construction products such as the MSA Latchways Constant Force Post can carry the Ü logo. MSA is the first and MSAsafety.com only manufacturer to gain abZ certification for its Latchways Constant Force Post anchor device used on Kalzip aluminium standing seam roofing (65/400). Mr Nigel Evens leads MSA’s engineered systems range across Europe. 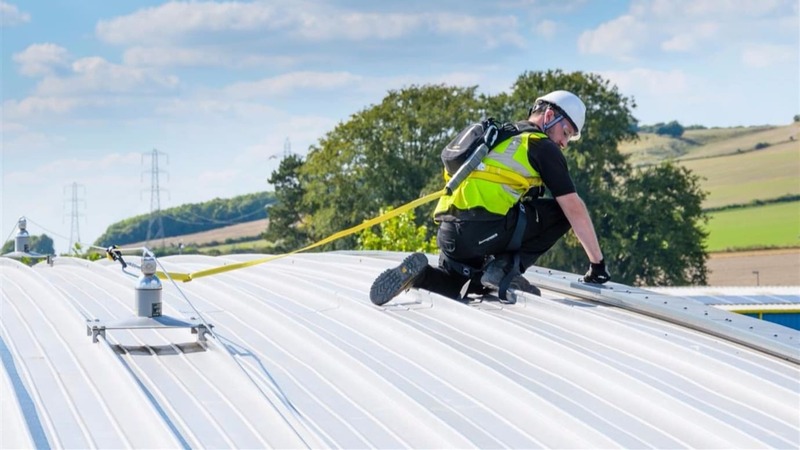 He says: “Our company’s reputation is built on innovation, forensic attention to detail and engineering excellence and we are driven by a desire to ensure that all those who need to work at height are given the ultimate in fall protection. MSA’s Latchways product range is built on a deep understanding of fall and load physics and a constant quest for innovation. Typically, an MSA Latchways Constant Force Post system can accommodate up to three users for a general application, but through DIBt and abZ testing has in fact been proven to have the capacity for up to six users. The energy absorption contained within the Latchways Constant Force Post (type 2) system delivers cable-based, load-absorbing fall protection for both fall arrest and restraint. This means that the force exerted on the point of attachment is typically controlled to 6.5 kN - so even after deployment, only the post needs to be replaced, leaving the roof construction completely undamaged. Developed in consultation with major roof manufacturers, MSA’s Latchways Constant Force Post installation needs no additional structural steel or purlins. It is also designed to be unobtrusive and aesthetically pleasing to preserve the architectural integrity of any building. If required, the Constant Force post can be RAL colour matched to the roofing surface. MSA Latchways systems can be found across the world on iconic buildings such as Grand Central Station in New York and the European Parliament building in Strasbourg.